(Nanowerk News) The big rigs rattling past smokestacks sure don't make this Chicago roadway look like the greenest street in America. A wind and solar generating unit used to power streetlights and a bioswale used to divert storm water from overtaxed sewers picturedin front of a high school on Cermak Road in Chicago, Illinois which Chicago city officials have dubbed the greenest street in America, on April 1, 2013. But their tires roll over smog-eating pavement, the streetlights run on solar and wind power, the sidewalks were made with recycled concrete, and shrub-filled "bioswales" keep storm water out of overtaxed sewers. 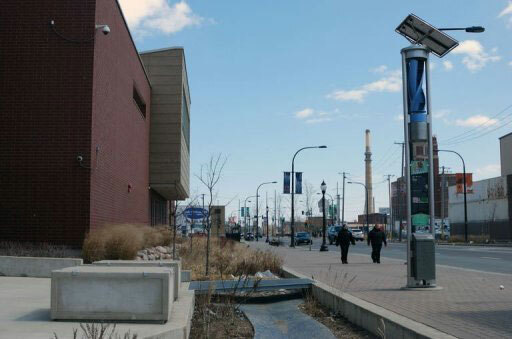 A wind and solar generating unit used to power streetlights and a bioswale used to divert storm water from overtaxed sewers picturedin front of a high school on Cermak Road in Chicago, Illinois which Chicago city officials have dubbed the greenest street in America. "Sustainability is critical for us," Karen Weigert, chief sustainability officer for the city of Chicago, told AFP. "We think of it as a part of quality of life, about economic opportunity in terms of what kinds of jobs we attract and about stewardship of tax dollars." The Windy City has been experimenting with greener approaches to urban planning for years as part of a broader plan to mitigate the impacts of climate change: more intense storms and more extreme temperatures. The $14 million project to reshape two miles (3.2 kilometers) of the industrial Pilsen neighborhood incorporates pretty much everything city planners could come up with to cut energy use, fight pollution, reduce waste, manage water use and help build a sense of community. Amazingly, it cost 21 percent less than a traditional road resurfacing project and is expected to be cheaper to maintain. "These are all critical issues for cities to address," said Karen Hobbs, a water analyst with the Natural Resources Defense Council. Heavy rain washes pollution off roofs, roads and parking lots which too often ends up in rivers and lakes that supply drinking water. If the storm drains get flooded, raw sewage can also end up in the mix. Planting more trees, shrubs and grass belts doesn't only help keep rain out of the sewers, it also helps capture carbon dioxide, reduces the "heat island" effect of sun-soaked asphalt and generally makes a neighborhood more pleasant. Improving public transportation and adding bicycle lanes reduces congestion while cutting pollution, which also improves quality of life. Cutting energy by using more efficient street light bulbs or installing the mini solar and wind power stations not only helps reduce emissions but also saves money. Chicago is one of a growing number of cities that are no longer waiting for the federal government to deal with climate change and are instead finding local, "no-regret" solutions, Hobbs said. "In other words, activities that save its residents and businesses money, improve quality of life and, as an added bonus, reduce emissions," she added. Chicago says it is the first in the nation, however, to lay down smog-eating cement. The seemingly magical material was first developed when the Vatican wanted to build a church to celebrate the 2,000th anniversary of Christianity that would stay white in the face of Rome's pollution. Italian cement giant Italcementi developed a product that uses titanium dioxide to set off a chemical reaction with sunlight that essentially cleans the surface of the church by speeding up the decomposition process. They discovered that it wasn't just cleaning the grime off the Dives in Misericordia church, it was also cleaning the air up to 8.2 feet (2.5 meters) above the roof's surface. Because it's significantly more costly than traditional pavement, Chicago is using it in thin, permeable pavers for the bicycle and parking lanes along Blue Island Avenue and Cermak Road. Project manager Janet Attarian insists that while the smog-eating pavers are pretty impressive, it's the combined approach that is going to make a real difference. "I really hope this project inspires people to think about the full range of opportunities that are available," Attarian said during a site visit. "We tend to take the roads for granted, like 'oh it's just a road what can we do about it.' But there's actually quite a bit." Reducing the storm water impact on sewers by as much as 80 percent means the city can hopefully prevent, or at least delay, multimillion-dollar upgrades to its aging system. Recycling 60 percent of the project's construction waste and sourcing 23 percent of new materials from recycled content means less pressure on the city's landfills and showed local contractors a new way to cut costs. Choosing drought-resistant plants for the bioswales means they ought to be able to withstand the hotter summers forecast as a result of climate change without wasting fresh water. Other details are more focused on building community, like benches near a pond that captures storm water from a high school roof and courtyard, new shelters at the bus stops and signs up and down the street describing the project. The city is currently drafting new guidelines that will incorporate many of these green approaches as requirements for any new road work going forward. "These infrastructure projects last for 50, 100 years so you can't afford to redo them again when you finally figure them out," Attarian said. "You have to be designing for the future not just the present."